A pretty-to-look-at western exploring themes of survival within the desolation of frontier territory, The Homesman offers a relatively original premise and a unique perspective, but otherwise gets bogged down in lengthy stretches devoid of meaningful progression. 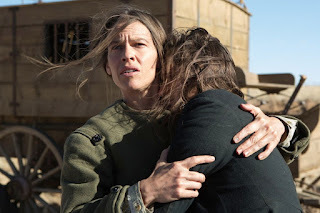 In the tiny western town of Loup City in the Nebraska Territory, Mary Bee Cuddy (Hilary Swank) is a wealthy single woman, looking after a homestead all by herself and still hoping to attract a husband. But her plain looks and bossy personality keep any potential suitors well away. After a long and severe winter, three married women from the small local community exhibit signs of severe mental instability due to child loss, abuse and isolation. After a plea from Reverend Dowd (John Lithgow), Mary Bee is the only person who volunteers to accompany the women on a grueling five week wagon journey to the much larger community of Hebron, Iowa, where a church can offer some medical care. At the start of the trip Mary Bee saves the life of a grizzled loner who calls himself George Briggs (Tommy Lee Jones), and tempts him with money to accompany her. He reluctantly agrees, they pick up the sick women and set off into the wilderness. Along the way they will encounter hostile Indians and bandits, with their non-communicative, irrational and sometimes hostile patients further complicating an already difficult trek. Directed by Jones and adapted from the book by Glendon Swarthout, The Homesman offers a rare women's view of the west. Unfolding at a slow and deliberate pace, the film presents the frontier as unforgiving and arduous, a place where women are pushed to the limits of endurance, often shouldering the full load of housekeeping, parenting and crop-tending and striving to meet the unrealistic expectations of the rough men they call husbands and fathers. The prevailing theme is rampant emotional damage, with all the main characters in The Homesman long-term casualties of the survival grind. The men do suffer, but use sadistic or violent behaviour as an outlet. The women are only able to absorb so much before aging fast and folding within themselves. While the three wives who have psychologically collapsed can no longer conceal the trauma, Mary Bee is also battling roaring demons fed by loneliness, rejection and despair, and waiting to emerge at a time of their choosing. As a viewing experience, The Homesman struggles to offer much beyond its relatively unique perspective. The flashbacks used to provide context around the sick wives' traumas are muddled and insufficient to draw them out as characters. Mary Bee's cargo therefore remains impersonal, and the entire film hinges on the relationship between her and George. 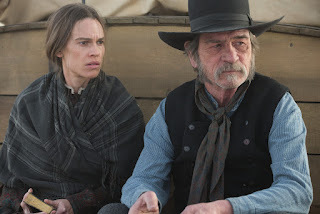 The tension between a determined and desperate woman and a frontiersman well past caring about anything other than the money in his pocket does provide a decent narrative foundation. But rather than evolve over the course of the journey, they will both simply reveal more of their true selves, and the film settles for being an examination of two people choosing different paths to cope with the rigours of the wild west. The film is visually beautiful, Jones and his cinematographer Rodrigo Prieto taking their time with plenty of open vista shots of an untamed west coloured by exquisite sunsets, Mary Bee's slow-moving wagon incongruously making its way through stunning but hostile and rarely traveled terrain. In the two central roles Swank and Jones do not disappoint, and deliver solemn performances filled with the pain of past mistakes and the uncertainty of the present. In addition to Lithgow, the supporting cast also includes James Spader as a land developer who tangles with George, and a brief, late appearance by Meryl Streep, a city dweller whose calm presence provides a sharp contrast between the struggles in the territories and the relative comforts afforded in established larger communities. The Homesman offers a journey that travels at the speed of two mules pulling a heavy wagon. It's not always graceful, but it does move ahead stubbornly, on its own terms.